The Taliban killed more than 100 members of the Afghan security forces inside a military compound in central Maidan Wardak province on Monday, a senior defense official said, reports Reuters. “We have information that 126 people have been killed in the explosion inside the military training center, eight special commandoes are among the dead,” said a senior official in the defense ministry in Kabul, speaking on condition of anonymity. The official said the assault began on Monday morning when the attackers rammed a car full explosives through a military check point and detonated the vehicle inside the campus of the National Directorate of Security (NDS) forces training center in Maidan Shahr, the capital of Maidan Wardak province. Defense ministry officials said the Taliban had used US-made armored Humvee vehicles captured from Afghan forces as a car bomb in order to breach the military fortifications. “I have been in touch with the NDS official in the province and they told me that over 100 members of the NDS were killed in the big explosion,” the former provincial official said. “The explosion was very powerful. The whole building has collapsed,” he said. Two senior officials in the interior ministry said the exact casualty figures was not being disclosed to prevent unrest within the armed forces. “I have been told not to make the death toll figures public. It is frustrating to hide the facts,” said a senior interior ministry official in Kabul. 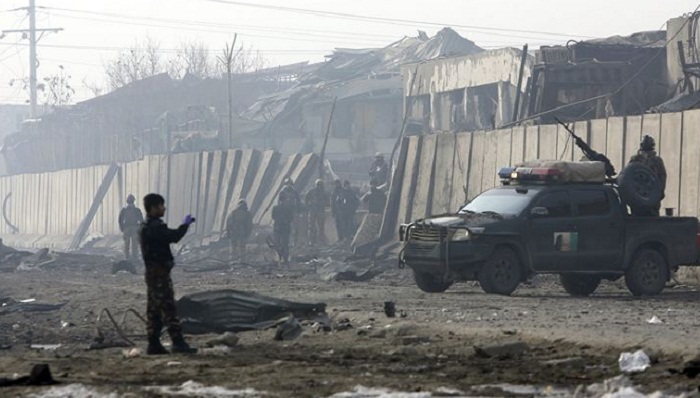 Taliban insurgents claimed responsibility for the attack. Zabiullah Mujahid, a spokesman for the hardline Islamic militant group said they have killed 190 people in the complex attack.